What a busy day it has been. Today, the House passed the bailout measure and the commentators are still having a field day with last night's debate. However, there was a major development on the political front yesterday that doesn't seem to be getting much coverage. Let me bring it right to your attention: yesterday, John McCain's campaign pulled out of Michigan. The McCain has always wanted to make Michigan, a state the went for John Kerry in 2004, into a tossup in this election. 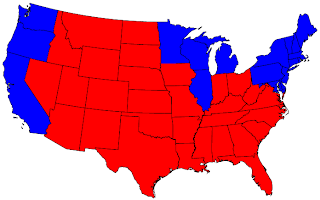 Unfortunately for McCain, with Obama making substantial gains in Florida, Ohio, Nevada, and Virginia, he simply could not continue to play offense in this blue leaning state. My guess is that in the next two weeks he will do the same in Philadelphia, where the polls have Obama up consistently by an average of 8 points. With Obama up about 3 points in Ohio, Florida and Virginia, McCain is on defense. If he loses Florida or Ohio, this election is done for. Now, let's say Obama wins Iowa (where he has consistently polled in a comfortable margin over McCain since the beginning of the race) and New Mexico (same story). That puts him up to 264. At that point, Obama is only 7 EV away from winning this thing. He can do it by picking up JUST ONE of the Five states he is currently leading in: Colorado (9 EVs, +4.4 average in the polls), Virginia (13 EVs, Obama +3), Ohio (20 EVs, Obama +2), Florida (27 EV's, Obama +3), or North Carolina (15 EVs, Obama +0.5). He might even be able to swing Indiana (11 EVs, McCain +2.2) or Missouri (11 EVs, McCain +1.7). The reassuring truth for Obama is that with the states he basically has on lock now, he only needs one of these swing states to give him the presidency on November 4th. According to most analysts, if the election were held today, Obama would win in an electoral college rout, with 353 Votes. While I am heartened by these numbers, what truly comforts me is the fact that Obama has many, many options for how to win this thing, while John McCain finds himself increasingly corned in a few states where he is trailing, with dwindling resources and few viable paths to victory. UPDATE: The NY Times has followed my lead, and has a great article about the changing dynamics of this race. Check it out here.